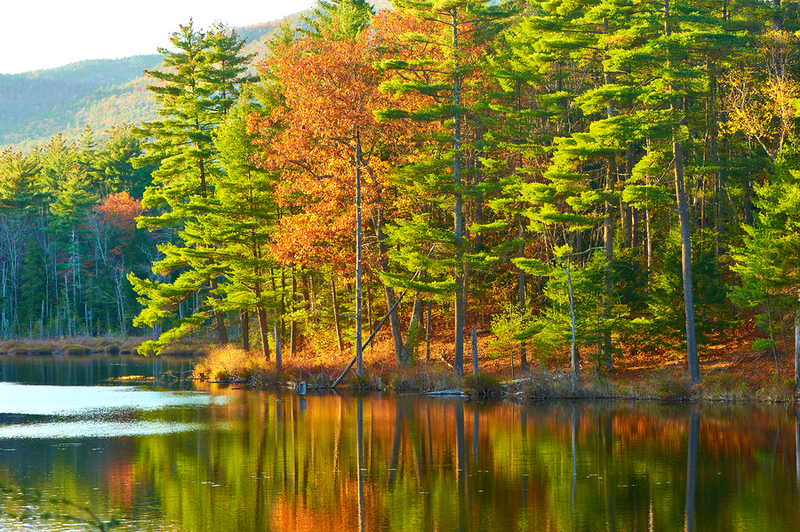 The fall foliage season is the most beautiful time to visit the Lakes Region in New Hampshire. Locals and visitors alike celebrate the bright autumn colors by hiking, biking and taking gorgeous scenic drives through the forests and mountains. However, nothing is more stunning than watching the brilliant foliage reflecting off the pristine waters during a lake cruise. Then again, enjoying mountain views from inside a train crossing a high trestle bridge is pretty hard to top. After your adventures touring the vibrant hues of autumn, return to your serene retreat at The Lake House at Ferry Point Inn. Our tranquil lakefront property has everything for a relaxing autumn vacation. Watch the sunset over Lake Winnisquam from our front porch or curl up by the living room fireplace at the end of the day. Enjoy a perfect night’s sleep and wake up to a satisfying gourmet breakfast each morning. Reserve your luxury guest room today before this amazing season slips away. Seeing the Lake Region in all its autumn splendor can be enjoyed hiking, biking or driving. Although a relaxing lake cruise or train tour offers a unique perspective. Consider these wonderful trips on water and rails during your visit. The largest lake in New Hampshire, Lake Winnipesaukee, has wonderful fall foliage dinner cruises on the Mount Washington. Gaze out at the clear water reflecting a colorful wooded shoreline with the mountains towering in the distance. It’s a fantastic way to savor the fleeting colors of the season along with great food and drinks. The smaller but idyllic Squam Lake also offers fall cruises as well. Not only appreciate the foliage along the rocky shores, also learn more about the natural history. 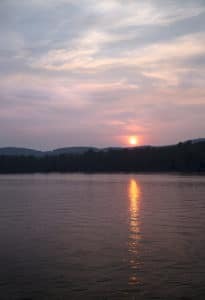 The 90 minute Squam Lake Cruises include viewing wildlife in addition to passing the famous “On Golden Pond” filming location. Touring this remarkably scenic lake is an unforgettable experience. 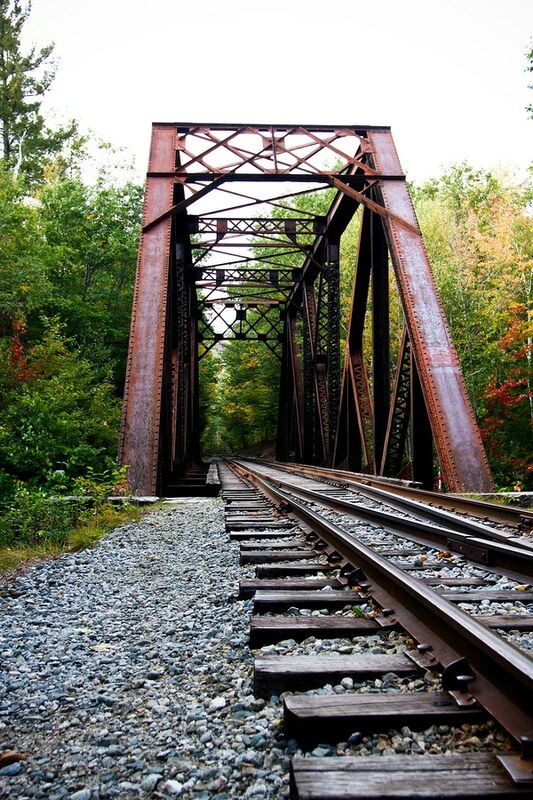 Train buffs and leaf peepers will love the train tours offered by the Winnipesaukee Scenic Railroad. 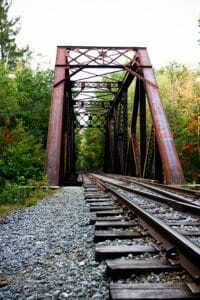 Two tours specialize in the fall foliage scenery on a historic railroad. The first tour is 90 minutes and departs from Meredith. It begins heading north towards the White Mountains and passes the Pemigewasset River, Lake Waukewan and Winona. While the second 1 hour tour begins at Weirs Beach and has great photo opportunities along the way. These tours are a truly charming New England experience. 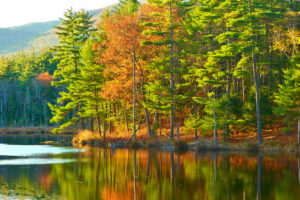 The Lakes Region has the special combination of trees, climate and landscape that make the most stunning scenery. The fiery hues of fall burn bright but the season is brief, so now is the time to plan an autumn vacation. Book your room today at the Lake House at Ferry Point Inn for a magical fall foliage trip.